Harrison suspended one game for hit on Browns' McCoy; is it enough? I'm on record saying that I thought this could be a much worse suspension. This wasn't a last second flip by McCoy where he dropped his head and Harrison couldn't avoid the helmet collision. James Harrison is a great player, and he had plenty of time to make a tackle without using his head as the tip of a spear. How many linebacker or safeties have you seen crucify a receiver without launching themselves head-first? 99% of them. Harrison refuses to change his style. He knows what can hurt the opposing player the most. And even though he's been warned, he declines the constructive advice of the rulebook. Ballcarrier or not, there's no place for tackles like that in football. It's just as cheap as going for someone's knee from the side. 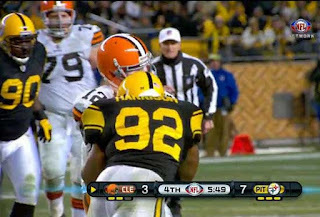 James Harrison is a great player who just doesn't have the line in his head that he knows not to cross. I thought in this case, a multi-game suspension would be warranted. I doubt this is the last time he'll be looked at for this. In face, doesn't Pittsburgh visit Cleveland in a couple weeks...? *Note: when I say 'brutal', I think that fits. Lots of hits that are perfectly legal in football are "savagely violent" or "punishingly hard or uncomfortable," as the definition of "brutal" reads. Many of Harrison's hits are bone crushing, violent--and yet legal, and truthfully, fantastic plays. But in this case, "uncomfortable" is a great way to put how Colt McCoy felt for a while after that one.